Add a little glycerin to your soap bubble formula and you'll have super-strong beautiful bubbles that, if you wear cotton gloves, you can hold in your hands. Add a little glycerin to sulfuric acid and nitric acid and you won't read the rest of this post because you'll blow yourself up. We're going to take a quick look at how the chemistry of these two effects are linked. I find chemistry vexing. Although chemists do wonderful things, the way chemicals interact with each other makes me think not of science, but of an over-complicated version of Magic: The Gathering. Every combination can be modified in so many different ways that it all just seems arbitrary. There's a lack of order. Case in point - glycerin. This is an oily, vaguely sweet-tasting substance that's made during the processing of fats. Usually it's made with animal fat, but it can be derived from plant oil as well. Glycerin is shaped like a rough "w," and at each of the crowning peaks is what's known as a hydroxyl group. A hydroxyl group is a oxygen and a hydrogen atom bonded together. The hydroxyl group is a marker of alcohols, and it's what makes glycerin, which seems so viscous that it should pool on top of water like an oil slick, dissolve into water perfectly. Because the oxygen in water molecules (H2O) pulls the electrons closer to it than to the hydrogen molecules, the oxygen side of the molecule has a slight negative charge, while the hydrogen side has a slight positive charge. The hydroxyl groups (OH) have a negative charge, and so they interact strongly with the water molecules. Very strongly. A quantity of glycerin left out in the open will grow twenty percent by grabbing water out of the air. A drop placed on the tongue will dehydrate it so fast that it blisters. (But properly processed, glycerin can help hydrate, as well. It's used in moisturizers and creams to retain water molecules and seal in moisture.) This is why it's used in bubble solution. 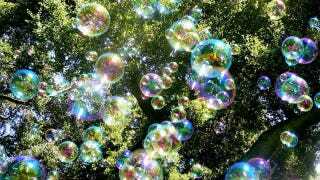 A bubble breaks because its large surface area gives water a major chance of evaporating away into the air. Glycerin and its hydroxyl groups grabs water out of the air and keeps water in the bubble, keeping it from breaking. One wouldn't expect the points of the "w" of glycerin to act exactly the same way when exposed to nitric acid as they do to water, but the difference in behavior seems excessive. Instead of water molecules attaching themselves to these attractive, negatively-charged hydroxyl groups, positive nitrogen atoms attached to a couple more oxygen atoms grab hold (shouldering away the hydrogen in the process). What results is an explosive that still outperforms many modern compounds. And instead of being a nice stable liquid that will keep together, it's so reactive that a too-fast drip can make the entire thing explode. The production has to be cooled to keep from exploding as it's being made. The oxygen that gets dragged, along with the nitrogen molecules, to the crown points of the "w" is the oxidizer. Any type of burning will need oxygen to keep going, and with three oxygen atoms attached to each of the tips of the "w," this has plenty. The body of the "w" has carbon atoms, which serves as fuel. The fact that the whole thing can erupt by being hit too hard is just a fun bonus, Magic-style. The same base, a slightly different molecule on each tip, and it makes all the difference between a bubble and a boom. Via ACI Science, University of Pennsylvania, JRank, and Bookrags.